Rich and silky smooth, White Chocolate Ganache is a great basic recipe to have on hand. 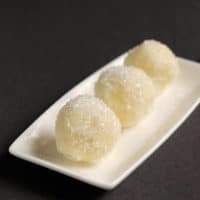 Whip it to create an airy cake filling or frosting, roll it in crystal sugar to make Snowball Truffles, or drizzle it on a cheesecake. The possibilities are endless. I bet when you hear the word “ganache” you immediately think of a luscious, dark chocolate treat that can be rolled into truffles, used to ice a cake, or fill a tart shell. 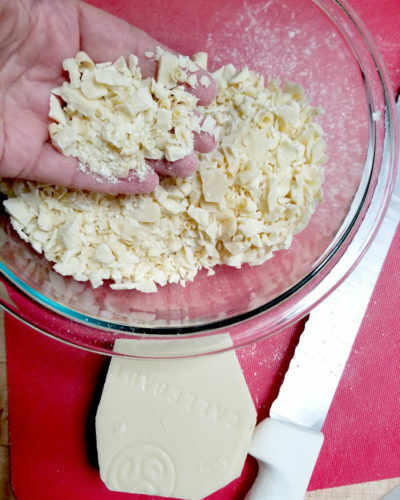 But did you know that you can also make ganache from white chocolate? 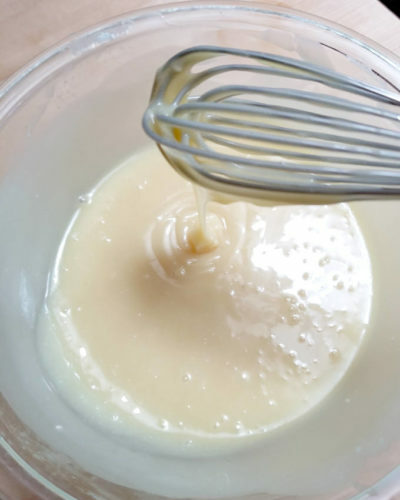 I’ve used White Chocolate Ganache in a bunch of recipes on this blog. 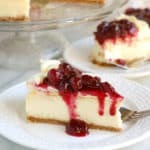 But I decided it was time to post this as a separate recipe because it is so versatile. I absolutely adore Dark Chocolate Ganache. 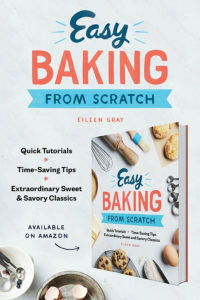 I think it’s an essential recipe to have on hand for making desserts and pastries. 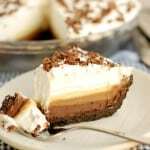 But, much as I love dark chocolate, it is a very assertive flavor that pretty much takes over any dish. No matter which flavors you put into dark ganache, the predominent flavor will always be chocolate. Believe me, as an avowed chocoholic, most of the time I’m perfectly fine with that. 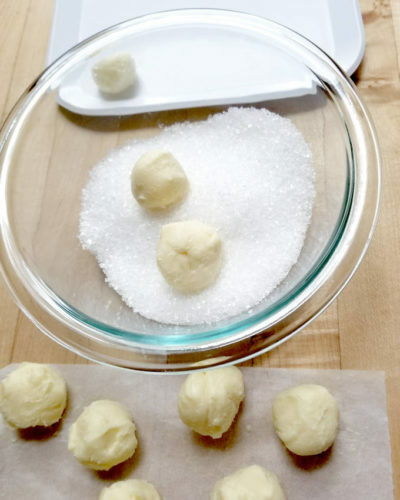 White chocolate is made from cocoa butter, milk solids and vanilla. It doesn’t have the “chocolate liquor” that gives dark chocolate it’s chocolatiness. White chocolate has a fairly neutral flavor. 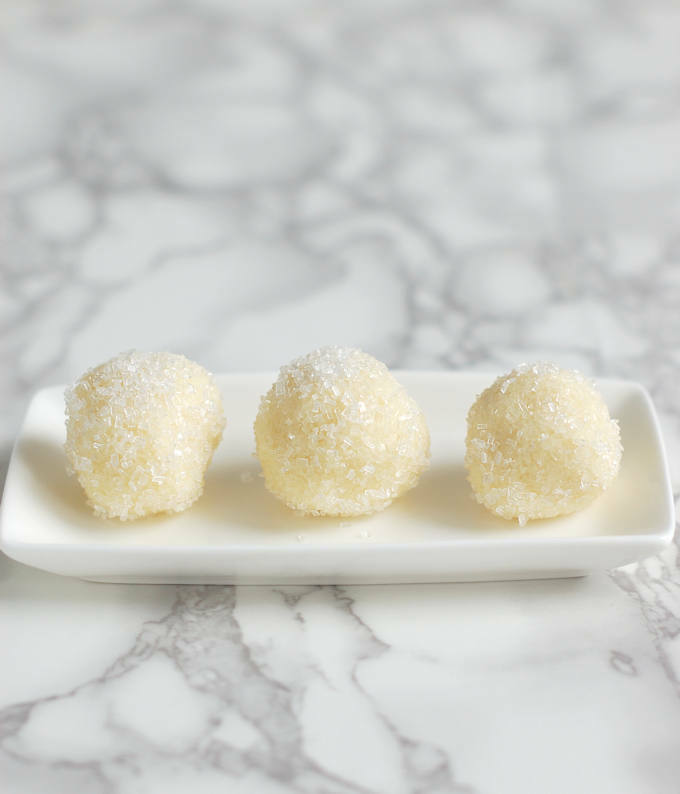 Thanks to that neutral flavor, White Chocolate Ganache will take on other flavors very nicely. Because it’s fairly soft, White Chocolate Ganache becomes incredibly airy and melts-in-your-mouth when it’s whipped. 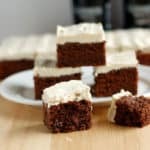 You can add raspberry puree to frost White Chocolate Raspberry Brownies, or a little Guinness for frosting Guinness Fudge Cake. 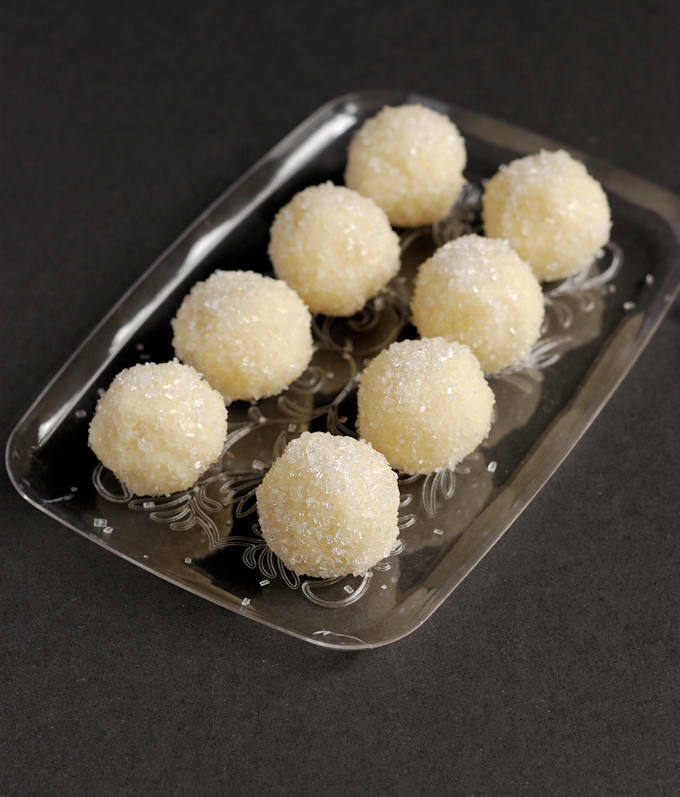 The main caution when working with white chocolate is that is softer than dark chocolate and can’t take as much cream. Dark Chocolate Ganache can be made with as little as 1/2 the weight of cream to chocolate, or as much as 2X the weight of cream to chocolate. 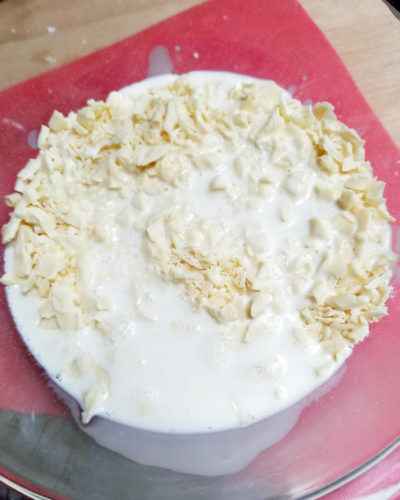 After lots of testing, I found that the proportion of 8-10 oz of white chocolate to 4 oz of cream yields a white chocolate ganache that will set up firm, but is still soft enough to whip into an airy frosting. 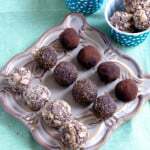 Because I was making truffles with this ganache I used 10 oz of white chocolate. You can reduce the amount of white chocolate to 8 oz if you want a slightly softer ganache for whipping. But I wouldn’t go below 8 oz or the ganache might not set up. One other note, please only use high quality white chocolate and not white chocolate chips or “coating chocolate”. Same as for dark chocolate ganache, the quality of the ganache is only as good as the quality of the chocolate. 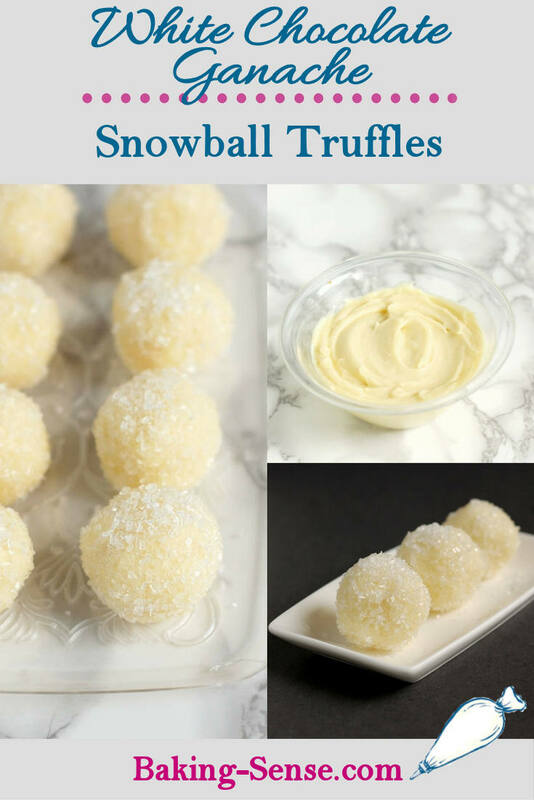 I think a few drops of peppermint oil would be the perfect flavoring for these Snowball Truffles. Wouldn’t they look great on your holiday table? Package them in a box with colorful ribbons for a wonderful homemade gift. 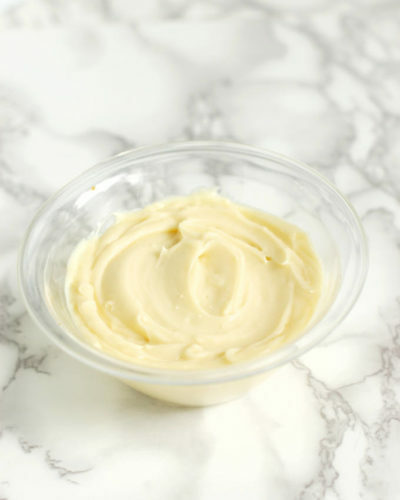 Creamy smooth White Chocolate Ganache is the base for so many great filling and frostings. 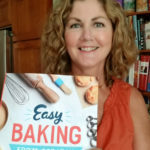 A good basic recipe to have on hand. 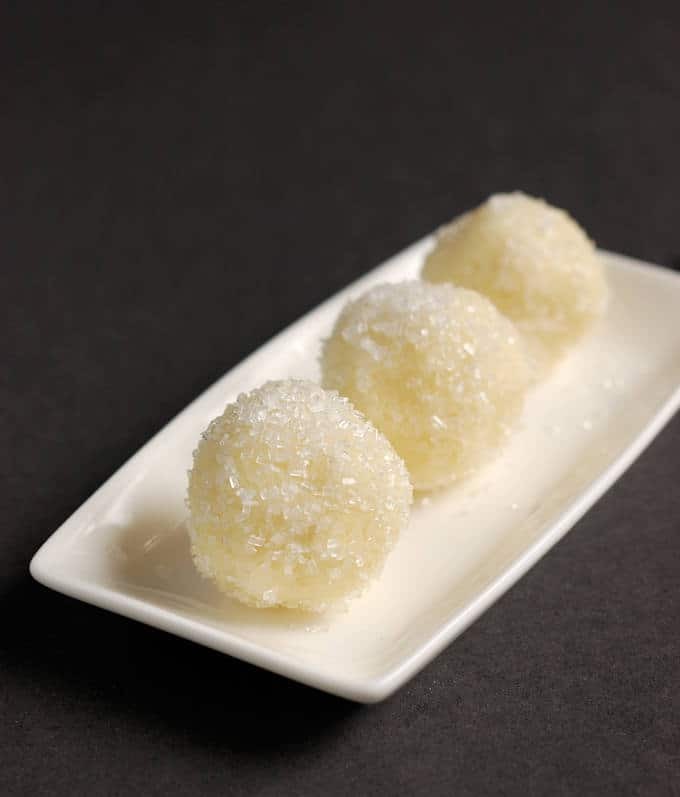 Place the finely chopped white chocolate in a bowl. Heat the cream in the microwave until it's scalding hot. Immediately pour the cream over the chopped chocolate and let it sit for 2-3 minutes. Gently stir the ganache until it comes together and all the bits of white chocolate are melted. 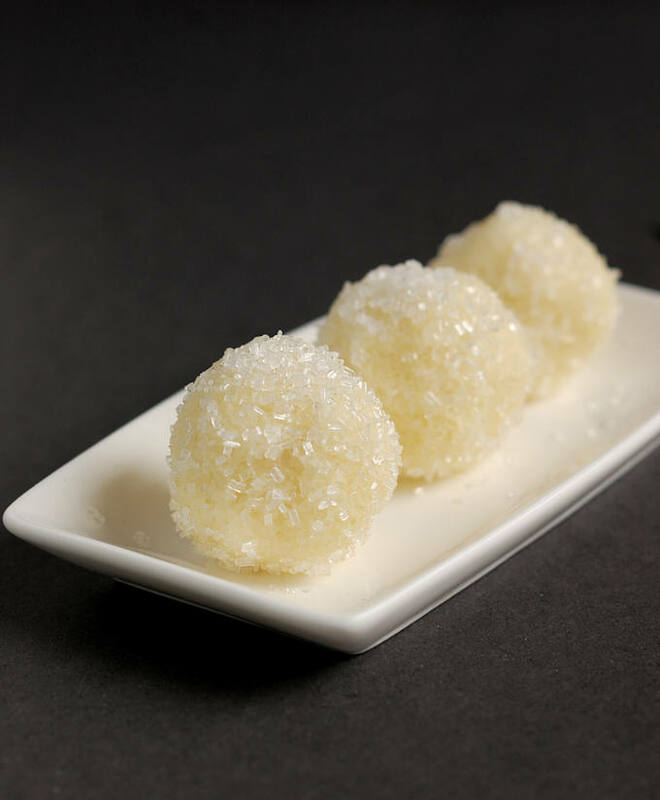 Scoop the chilled ganache and roll in crystal sugar to make Snowball Truffles. 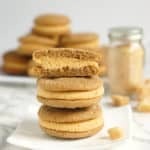 Some of my favorite flavor add-ins are ground cinnamon, orange zest/Grand Marnier and instant coffee. 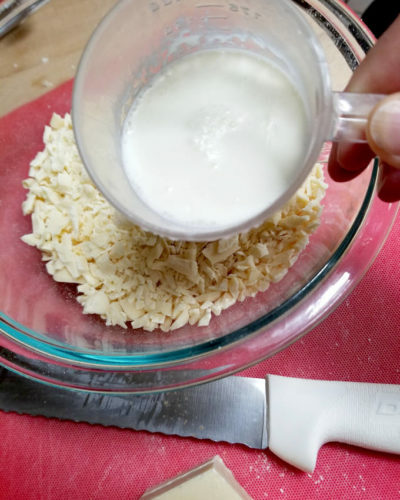 Add the solid flavorings to the cream before heating. Add any liquid flavors after all the chocolate is melted. Eileen, you may be able to help me. 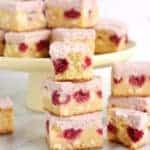 Using a recipe partly similar to this, I have been trying to develop a Cremeux using white chocolate. My imagination tells me I should be able to get a consistency like thick dollop cream, that will stand up when plated, rather than run, and give a silky mouthfeel, with a delicious white chocolate kick..I am trying to avoid the slightly floury mouth feel that’s often present when a more thickened custard approach is used. Hi Malcolm. Hmmm, I get what you’re asking. I’m not sure this white chocolate ganache would get the exact texture you’re after. When I whip the room temperature ganache (as I did for the pumpkin ganache in my ginger cookies) it becomes the texture of loose whipped cream. But it is still flowy. After chilling a bit it becomes firmer. I think you’d have to maybe play with making a white chocolate whipped cream, rather than a ganache. I haven’t done it specifically with white chocolate, but I have made chocolate whipped cream by liasoning (is that a verb??) melted chocolate into whipped cream. Ha, ha, Liase! Thanks. But I agree that getting the cremeux texture might work better starting from a mousse or whipped cream than a ganache. 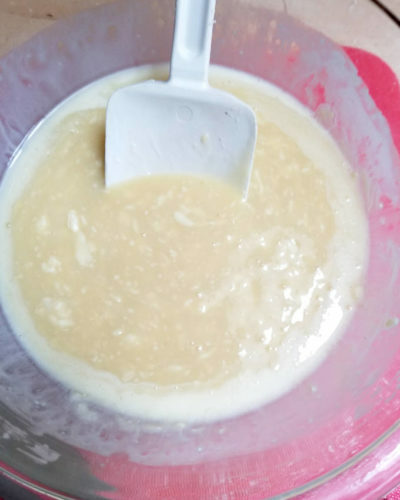 I did a white chocolate chip (one 11oz bag)with (1can) sweetened condensed milk wirh a teaspoon of vanilla . Melted over boiling water. A little thicker than I wanted but formed nicely. Hi Rhonda, I think white nonpareils would also be nice and in keeping with the “snowball” theme. You could use any other color or shape sprinkles, depending on the effect you want. You could roll them in melted white chocolate and let them set. Unfortunately, powdered sugar would just melt away so that’s not an option. There is a product called “snow sugar” that is a non-melting powdered sugar, but, personally, I don’t think it tastes very good.